Hey all. Im having an issue with my Borgeson Power Steering Kit.... It started dripping so I checked all the hoses, the hoses are fine... the problem is the two bolts that hold the pump to the mounting bracket (shown in picture below). I sealed everything else up and blew air into the system causing fluid to gurgle up through the bolt holes. Any ideas, or links to fixes would be great. I am almost done with my project and this has ground me to a halt! Something is always leaking, right? Even if its brain fluid out my ears, for me anyways. I actually have a fun product around here called Flex-Seal that works well for problems like this if sprayed around the bolt while it is a bit loose, then the bolt tightened up. Any sealer like that applied in the area should plug up a minor leak, assuming it isn't a crack anywhere obscure. That's all I've got. Is there supposed to be a washer between the housing and the bracket? did you try some Teflon tape on the threads of those bolts? Suspect that there is a gasket behind the pump to the block that has failed and the bolts are just where it is seeping out. 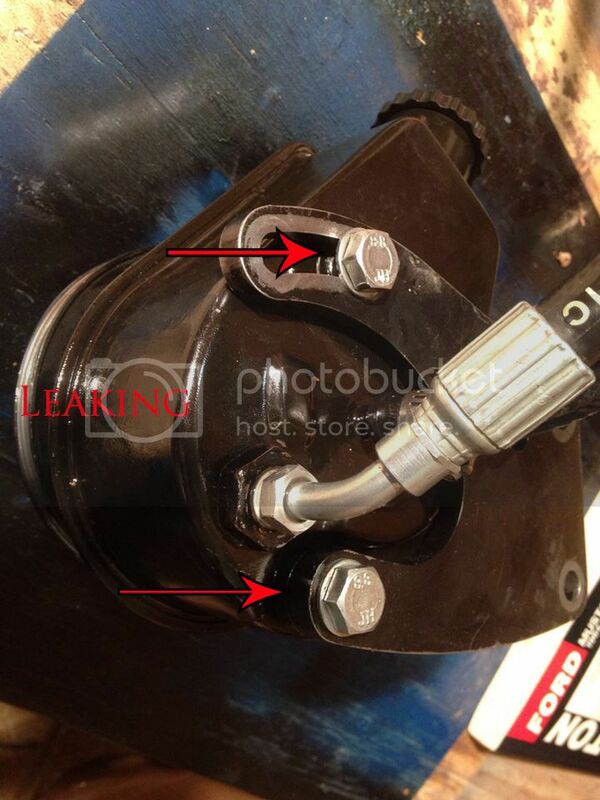 The bolts are not the seal, the seal is at the mating surface behind the pump body. Buy a new pump and all the gaskets and seals. It's not worth guessing which one of the 4 or 5 service parts it is, just do them all. maybe add a copper washer under the bracket along with the thread sealant?